A large fire burned approximately 100 acres of brushland in the western section of Rio Grande City near two subdivisions in the late afternoon and evening of Friday, Aug. 7, but many firefighters at the scene managed to stop the blaze and limit structural damage to the back porch of one home. He indicated, “The fire broke out at approximately 5:30 p.m. (Friday). 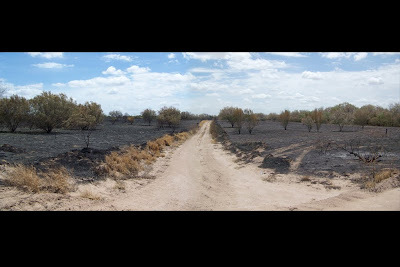 Roughly 100 acres were burned…We responded initially with three units – a tanker, a brush truck and one engine.” The fire escalated to the point that 13 other fire departments in Starr County and the Valley arrived at the scene to provide assistance. Reyes noted that the Roma, Salineno, Zapata, La Rosita, San Isidro, La Casita, La Grulla, La Joya, Sullivan City, Palmview, Mission, McAllen and Edinburg Fire Departments sent firefighting units to help contain and extinguish the blaze. He pointed out that the Rio Grande City Police Department and Starr County Sheriff’s Department assisted with traffic control. Reyes declared that the blaze did not come close to being a serious threat to Starr County Memorial Hospital.